Make a Positive Impact on the Environment with Your Printer | TonerGreen - Eco-Friendly Toners from the U.S. If you think taking an action to preserve our natural resources need a considerable amount of time and effort and serious devotion to our Earth, then you might want to rethink that thought. Helping our environment can be one of the easiest things you can do. In fact, you can even do it on a daily basis without even sacrificing your time. All you need is to change some ways and the products you use to help save Mother Earth. You can even make a positive impact on the environment with the way you print! Yes, you can help our environment by the proper use of your printer. Look for Energy-Star qualified printers - Energy Star is an international standard for energy efficient consumer products. Printers that are energy-star qualified have eco-friendly features that reduce energy consumption and lessen your carbon footprint. An example of such feature is HP's Auto-On/Auto-Off Technology which turns on the printer when needed and turns it off when not. Use duplex-mode or double-side printing as much as possible - There are types of printers that have duplex-mode or allow double-side printing. These reduce your paper usage by up to 50%. Choose recycled papers instead - The next time you hit the market to buy papers for your printing supply then why don't you pick recycled papers. There are quality recycled papers in the market which aren't different from new papers, sometimes even more glossier. This wise choice can save trees from being cut down. Choose remanufactured ink cartridges or remanufactured toner cartridges - These remanufactured printer cartridges are also known as recycled cartridges. These are used OEM cartridges that are refurbished and refill with new toner or ink then re-package for resale. But don't let the term "remanufactured" fool you. These printer cartridges went under several processes to ensure they meet or sometimes even exceed the performance and page yield of their OEM counterparts. By supporting these cartridges, you help to reduce the waste ending up in our landfills like rubber, plastic and foam that take a considerable amount of time to decompose. It also conserve raw materials and oil from being used in manufacturing new cartridges. Check for errors and mistakes before you print that document - The most common mistakes printer users do is that they forget to preview they're documents before hitting that print button thus printing documents with typographical errors or wrong sentence structure which of course, automatically are thrown to bins. You just don't waste paper because of this, you also waste your ink and toner so be cautious and check your documents before printing them. At TonerGreen.com is your environmental-friendly online shop for U.S.-made remanufactured printer cartridges for known brands like HP, Brother, Canon, Dell, Lexmark and Xerox. We take pride in the superior performance of our products compared to the average compatible and remanufactured cartridges found everywhere. Our products are not just ordinary recycled toner cartridges, quality is strictly imposed every step of our remanufacturing process. TonerGreen helps you save our environment while saving some money too by offering premium remanufactured printer cartridges at the most affordable prices. So what are you waiting for? 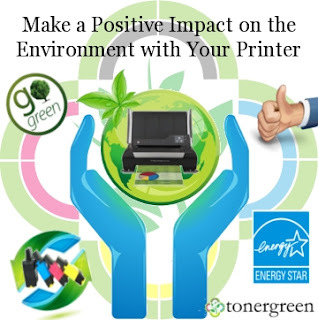 Start making a positive impact on the environment with your printer by using TonerGreen printer cartridges!